Image Description: the background is a white flat surface with stationery items resting on top of the surface. 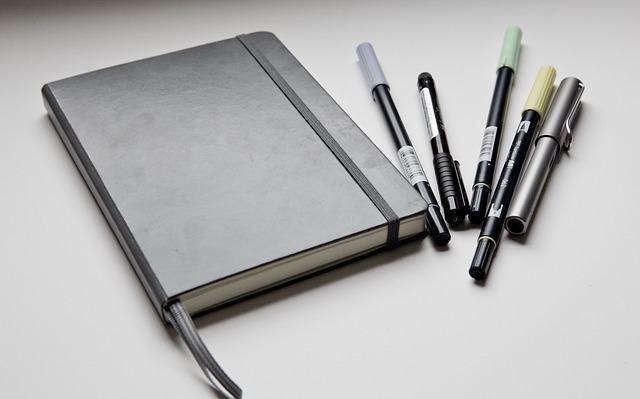 From left to right, a silver notebook (grey coloured elastic bound around it to keep it closed and grey ribbon poking out the bottom), four black pens with different coloured pen-caps, and a thick silver pen. It has recently come to my attention that it’s been a while since I’ve done a blog-post on my Bullet Journal and page designs. Now, I think I may have said that I would try a different design each quarter, however, I have since realized that this would take a lot of time and effort. Both of which are currently in short supply. My quarterly designs and monthly designs were working fine (for now). The designs I had researched are fine. They just need the occasional tweak to make them more effective. I have also decided that this quarter is a quarter of review and revision. I didn’t want to spend time looking into new Bullet Journal page-designs/layouts when I should be using that time to complete remaining tasks. Sometimes my Bullet Journal is a useful organisation and time-management tool, sometimes it is a distraction and an excuse for procrastination. In January, I may do some research on more effective Quarterly page designs (and Future Log pages as well), but my Monthly pages are working alright for the time being. First up; My Quarterly Pages. The Quarterly pages have a rainbow theme for titles, however, using rainbow titles was more effort than I had first anticipated, so I decided to reserve that just for quarters. 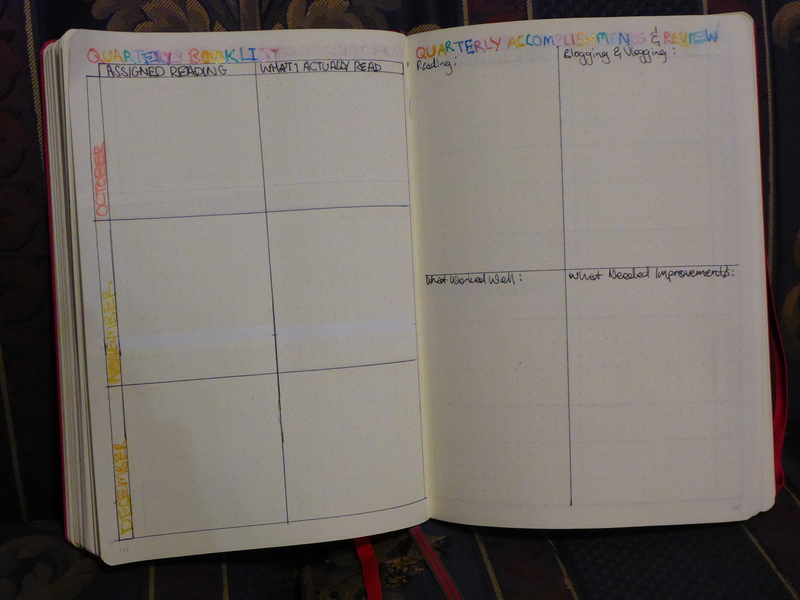 I eventually decided that I would use one colour for monthly pages and monthly titles. April was green, May was light blue, June was dark blue, July was purple, August was pink and September was silver. 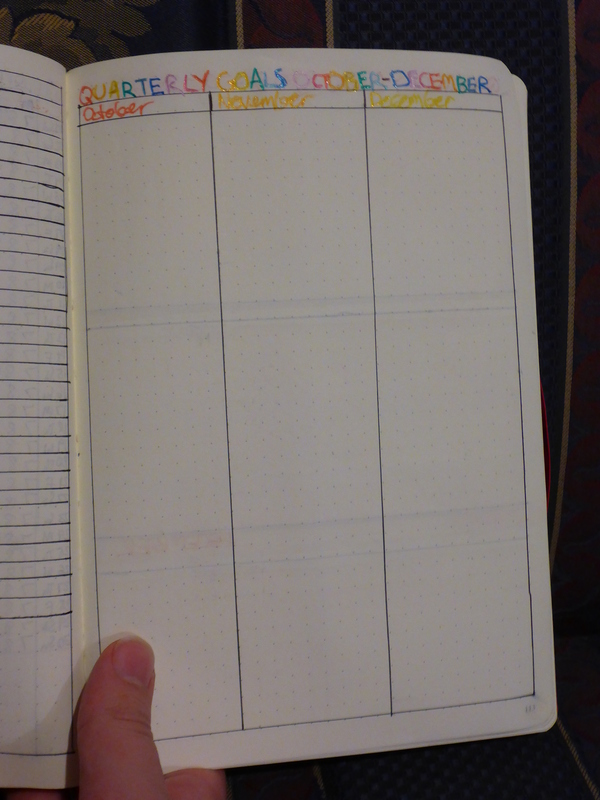 This means I start right back at the red-orange-yellow theme for the October-November-December quarter. Ryder Carrol recommends retiring a Bullet Journal at the end of the year and starting a brand new one at the beginning of each year. I have mixed feelings about this. For starters, while Leuchtturm 1917 notebooks may be easily accessible and cheap to purchase in other countries, however, this is not the case for Australians. 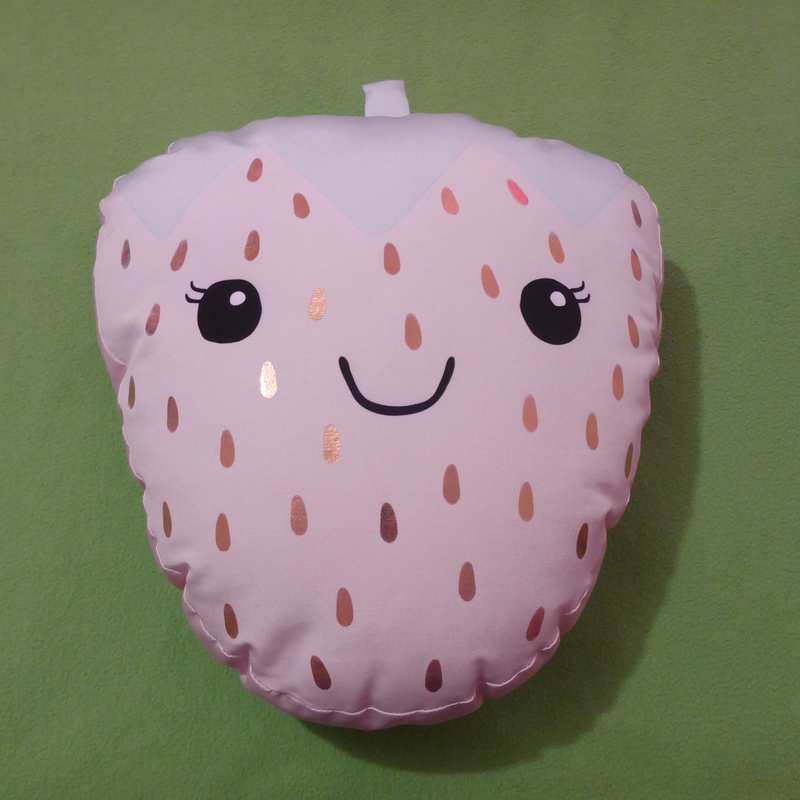 There are import taxes and shipping fees to consider. Starting a new journal while I still have space in my current notebook doesn’t sit well with me. I do understand the benefits of a fresh start but… yeah. Either way, I’ve got three months to figure out what I’m going to do. These are the page designs/layouts I’ve been using since April, with small changes here and there. Image Description: My quarterly goals page has “Quarterly Goals: October – December” in a rainbow text. Underneath that are three vertical columns with title headers up the top of each column. From left to right: “October” in red text, “November” in orange text, and “December” in yellow text. I’m not entirely sold on the Quarterly Goals page-design. A lot of the goal page-designs I’ve seen are more “Journal” style design, as in “These are my goals, I’m going to write down all the things I want to achieve.”. That sort of thing doesn’t work for me. I like lists, I like check-boxes for tasks, and I’ve noticed that I work better when big generic-sounding tasks (like say, clean the house) are broken down into small sub-tasks. Jessica and Edward from How To ADHD has done a couple of videos (part 1 and part 2) on the subject. The problem with this is that it relies on the person in question already knowing how to break down a big project (like clean the house or even write a book) into those smaller sub-tasks. I don’t always know how to do this or how to space out tasks so that I’m not overwhelmed and doing everything at the last-minute. I found it difficult to remind myself that I have a three-month deadline for tasks, so I end up doing a lot of tasks in the last month instead of spacing them out like I was supposed to. Maybe adding a start and end dates for the quarter might help. Image Description: Two pages in my Bullet Journal and both pages have been divided into three horizontal sections. From left to right: up the top of the first page is “Quarterly Blog Posts – October” in red text, then in middle section “November” in yellow, then in the last section “December” in orange section (I messed up the colour order for this quarter). 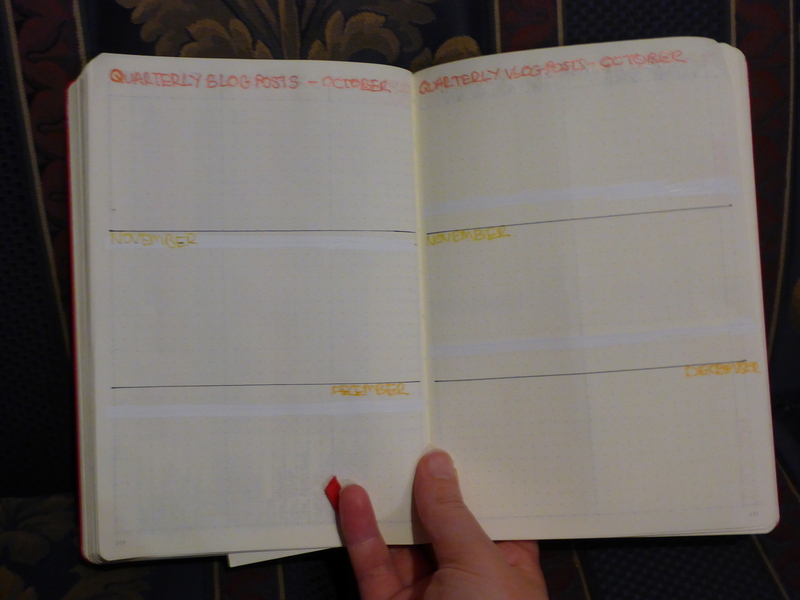 From left to right: up the top of the second page is “Quarterly Vlog Posts – October” in red text, then in middle section “November” in yellow, then in the last section “December” in orange section. This section is the section I’m most happy with. It’s effective, it works, and it’s easy for me to see the pattern in the topics I’m talking about per quarter, It makes my quarterly review a lot easier. 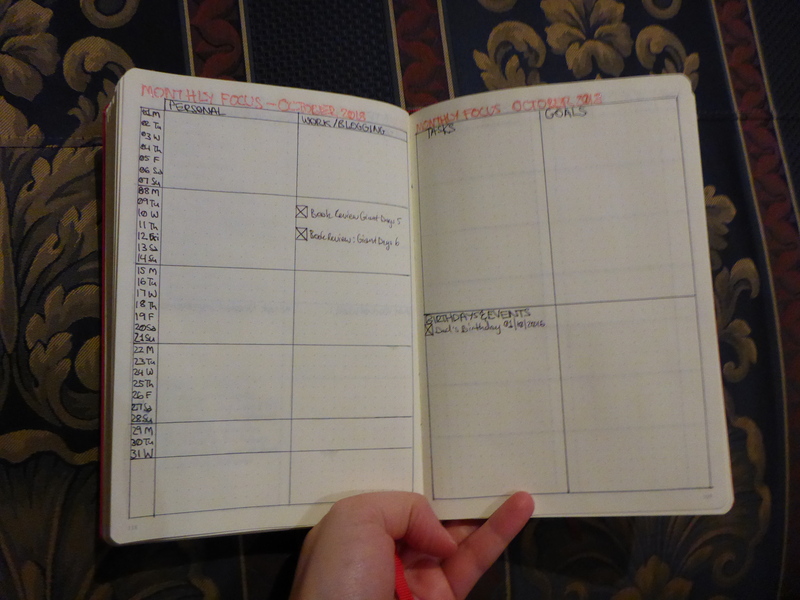 I recommend this type of page for keeping track of blogging and vlogging, however, do whatever works for you. Image Description: From the left to right: the first page has “Quarterly Booklist” in rainbow colours. Underneath that is two vertical columns that have been divided into three horizontal sections. So, the page looks like six squares with a small section for month titles. The second page (on the right) has “Quarterly Accomplishments and Review” written up the top of the page, the text is in rainbow ink. The page design is a large plus sign drawn into the page so that it’s divided into four sections. My Quarterly Booklist page has undergone some changes since the beginning of the year. Honestly, this page has frustrated me, mostly because there’s been a big difference between the books I assigned myself to read, and what I actually ended up reading. This design incorporates what I was “supposed” to be reading versus what I actually ended up reading for the month. I have a separate book that acts as a reading journal. This is just a quick monthly summary. My Quarterly Accomplishment and Review page is set up in a 4-box-section. I use these sections to do an overview of my reading habits, what types of Blog-posts I’ve been writing over the quarter, what worked this quarter, and what didn’t work this quarter. This section used to be the hardest section to write about. Now that I’ve given myself more structure with regards to overview, I find it’s easier for me to write notes about it. Image Description: The image is of two pages in my Bullet Journal. On the left, page one has “Monthly Focus: October 2018” in red ink up the top of the page. Underneath that is two columns labelled “Personal” and “Work/Blogging” up the top. On the side is a thin vertical column that has date and day of the week. The columns are divided into weeks. On the right, page two has “Monthly Focus: October 2018” in red ink up the top of the page. Underneath that the page is divided into quarters. I quite like this monthly layout. It helps to remind me about my personal/social objections and my work/blogging tasks at the same time. I can’t do a lot of blogging if my partner and I are going off to Wentworth for a week. It’s also a good reminder of “When was the last time I caught up with my friends?”. I have the dates written down and it’s easier to check. 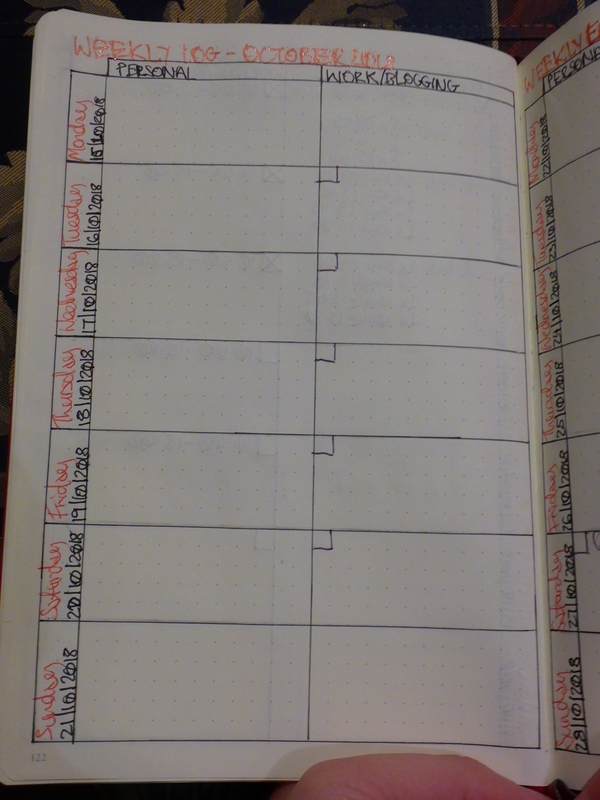 Image Description: The page has “Weekly Log: October 2018” in red ink up the top of the page. The page is divided into two columns: “Personal” and “Work/Blogging”. There’s a thin vertical column that details date in black ink and day of the week in red. The columns are divided into seven sections to represent days of the week. I’m super happy with this design, even though it takes a lot of effort to draw up, I find it’s worth the effort. Previously, I could only write down either a personal task or a work task, and I get the reasoning behind that, I’m trying not bite off more than I can chew and I don’t want to overwhelm myself. But the reality is that I’m probably always going to have to have a day job to support my creative projects, I have to take into account that I work an 8-hour shift five days a week, which means it’s difficult to socialize after work. If I’m working 08:00 – 16:00 on a Saturday, I can still possibly do a dinner thing in the evening, people just have to be accommodating. Image Description: There’s a thin vertical column that displays date and day of the week. In the large section next to date and day of the week, there are numbers next to it representative of hours in a night and day. You highlight the respective numbers to indicate how many hours you slept. 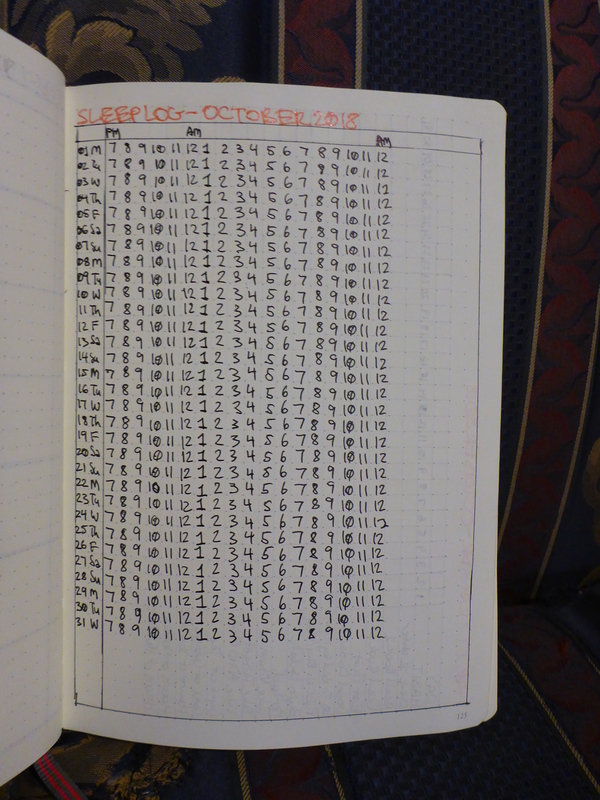 I’m considering changing the Sleep Log design for next year, however, it works for the moment. I want a sleep log that has a more precise time function. At the moment, so it’s currently working on only an hourly basis, which means I can’t highlight if I went to bed at 10:30. It could look like I’m getting more sleep than I currently am, which would defeat the whole point of the sleep log. 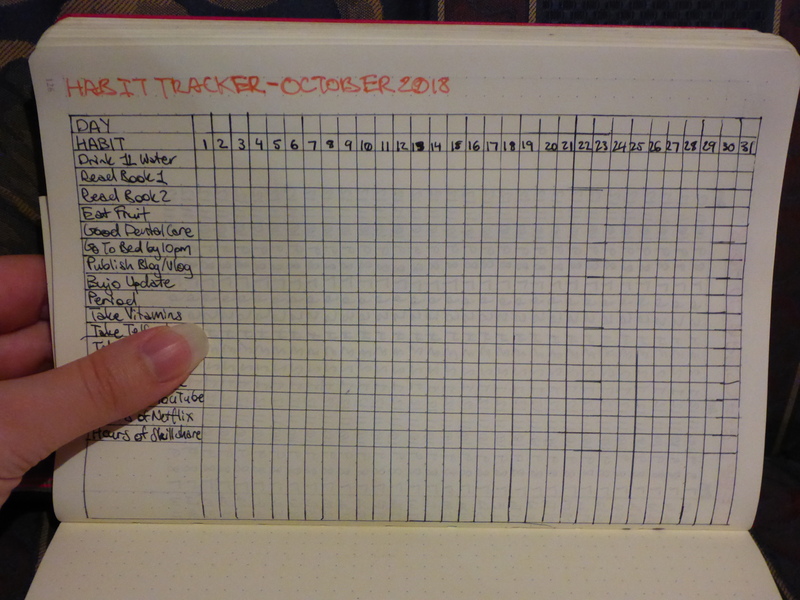 Image Description: A drawn version of an Excel spreadsheet, with habits down a vertical column and days of the month across the top horizontal row. The habit tracker takes a lot of effort for me to draw up, for next year I’m even considering just printing out a template, and sticking it in. It doesn’t help that my drawing/pen-skills aren’t that great. But I like the design itself, the habit tracker is very useful for me, would definitely recommend some variation of one in a Bullet Journal. That’s what I got for you today. If you want to leave links your blog-posts or videos to your Bullet Journal, or you want to talk about page-design/page-layout, let me know in the comment section below.